The following came in from Brad Timerson of ASRAS and the International Occultation Timing Association (IOTA). 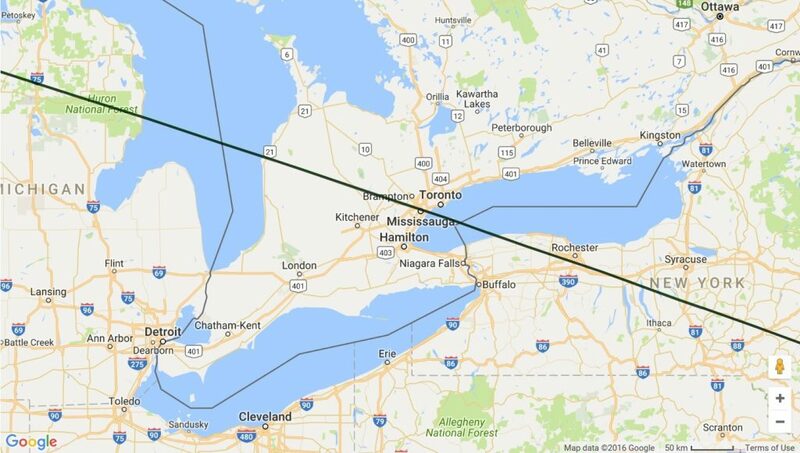 We had a few posts back in 2014 about an occultation of the star Regulus by asteroid Erigone (on what turned out to be an overcast March 20th. For information about the event and the observing process, see the original CNYO occultation post. Local observing path for the lunar occultation of Aldebaran on March 4th. I want to alert the membership about this great opportunity (if the weather cooperates!) 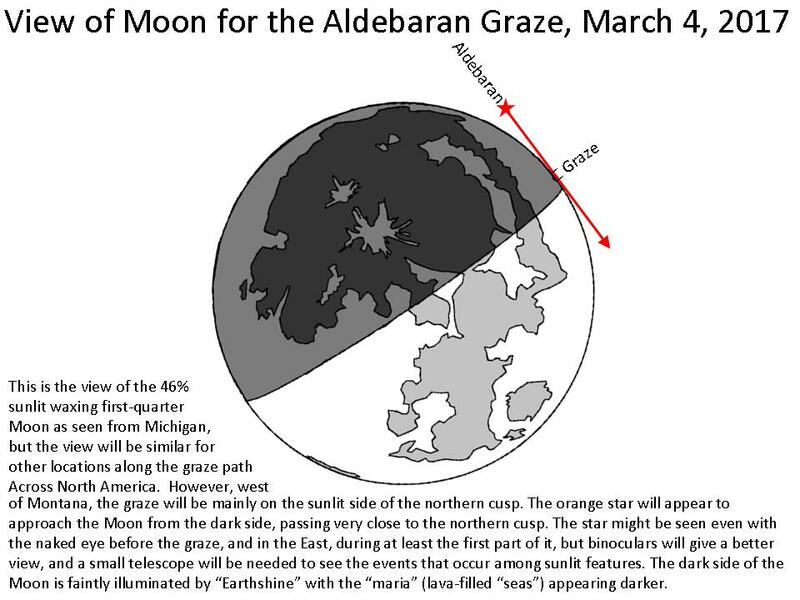 of seeing a lunar grazing occultation involving a bright star, Aldebaran, along the northern edge of the nearly first quarter moon on the evening of March 4, 2017. In small telescopes, it should be a spectacular sight. Zoom in to see path through your area. Set the line A to a value of +0.2 km (enter value in box and then press “Click here”). Set line B to –0.1 km. This will produce 2 gray lines, one just north and one just south of the green line. These 2 lines (with the green line in the middle) will mark the best locations for an observing site. A grazing informational image from the IOTA page. Based on recent grazes, it appears that you will want to be exactly on the green line shown on the Google map or just barely south of it to see the maximum number of events. Many of the events will be gradual or partial (the star not completely disappearing) because Aldebaran is a large star and at the moon’s distance, won’t be completely covered for some locations. I plan on observing the graze from a store parking lot (after getting permission) along Rt. 96 near Clifton Springs, NY. Anyone near this area is welcome to join me. I will have more details on my location as the date approaches. I will be videotaping the event using a special camera and video time inserter so that important details of the lunar limb and, possibly, the star, can be determined. 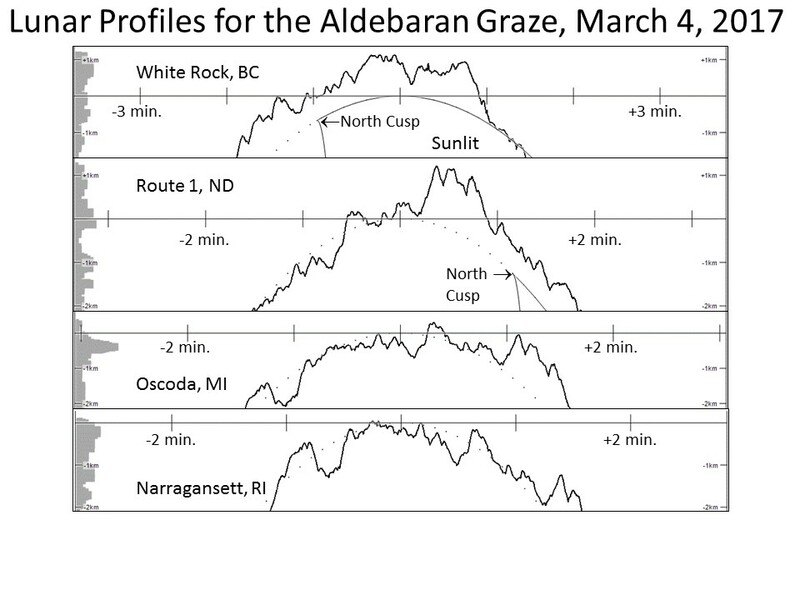 Profile maps of the Aldebaran occultation from the IOTA page. Central graze time for the Rochester area is 11:17:57 pm on the 4th. You’ll want to be setup well ahead of this time with a clear western horizon. The moon will be about 18° above the horizon. You may see events occur for up to a minute before and after this central graze time. Below is a profile of the lunar limb showing the predicted graze limit as well as a dotted line at about 0.2 km south of the limit. The gray bar graph at the left shows the number of events that can be expected to occur. Time is along the bottom with 11:17:57 pm centered. Please email me individually (btimerson [_at symbol_] rochester.rr.com) if you’d like information about a specific site along the graze path. Include the latitude, longitude, and elevation of your site taken from Google Earth of the Google map. Also, any other questions you might have can be directed my way. Here are links to the pages summarizing observations made at the last two grazes. Many observations have YouTube videos available so you can see what to expect.